I had my eyes out for this arboreal dragon while hiking in this area, but only managed to find this one youngster being decidedly non-arboreal. 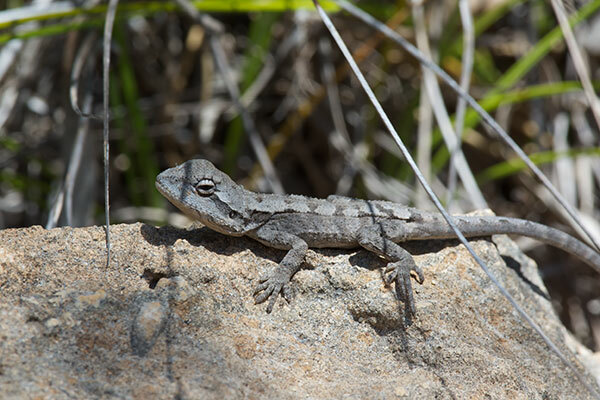 After I got this in situ photo, the lizard hopped off of its perch and tried to escape in the brush. It moved remarkably slowly, and I easily caught it to try to get it to pose for a less obstructed photo. But when I started fiddling with my camera, it ran toward me, then up my leg and my back until I felt it on my neck. And then I lost it. I was standing in the middle of the trail at this point and should have been able to see it try to escape on the ground, but I didn't. I assumed it must still be on my clothing and even took off my shirt to check the folds, but I never saw another sign of it.